Welcome to this month's Constellation Showcase! This monthly segment details a currently viewable constellation, typically somewhere along the ecliptic or high in the Northern sky. This month we're going on a tour of Hercules, the Roman Hero! In the star chart to the right, you can see the constellation Hercules. Hercules isn't a very bright constellation, but it contains a few interesting stars and clusters. To find Hercules, I usually find it easiest to first locate the central square segment. 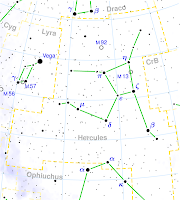 The constellation Cygnus can be useful in finding Hercules, as it is a very easy constellation to find (it is shaped like a cross) and is near to Hercules. Hercules is a Roman adaptation of the Greek demigod Heracles. Heracles was the son of Zeus and Alcmena, a mortal. This makes Heracles half-god, half-mortal. There are many legends regarding Hercules, one of the most famous being the Twelve Labors of Hercules. The only notable nebula in Hercules is Abell 39. 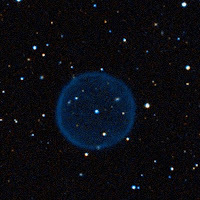 This planetary nebula is very close to spherical in shape, and can make an interesting target in medium to large telescopes. Planetary nebulae form at the end of their central star's life. Stellar winds blow gas outward into space, forming a nebula. You can see this cool planetary nebula in the image to the left (WIYN/NOAO/NSF). The Abell 39 nebula is about 2.5 light-years across. The outer shell of the nebula is only about 0.34 light-years thick. In the center of the sphere, you can see a star. This is the central star, and the source of the gas that makes up the planetary nebula. It is approximated that this nebula started to form a little over 22,000 years ago, and has been expanding at a rate of about 35 km/s. 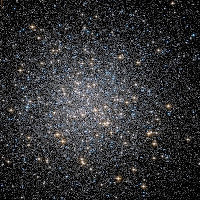 Hercules is home to one of the most famous globular clusters, M13. This beautiful globular cluster, also known as the Great Cluster in Hercules, contains a few hundred thousand stars packed into a spherical cluster only 145 light-years across! Even in small telescopes, this cluster is astonishing. In larger telescopes, M13 takes on a whole new look. The larger the telescope, the smaller objects it can resolve, so medium to large telescopes really start to show great detail in M13. Under dark skies, it is sometimes even visible to the naked eye! To the right, you can see the Hubble image of M13. The position of M13 is marked on the constellation map at the top right of this article, too. Hercules is also the home of M92, another globular cluster. Although it isn't as impressive as M13, it is still an entertaining target. M92 is also marked on the map at top right. I hope you enjoyed this month's installment of the Constellation Showcase, and that you will join us next month, when we will showcase another constellation!